A podcast series that will fill you in on what's going on at Filene Research Institute and out and about in the financial services world surrounding industry topics. Ep. 48: Do Credit Union Mergers Create Member Value? One major question lingers: do mergers create value for members? The promise and peril of being undefined in a time of political polarization. In the spirit of our love for prototyping and innovation, we are trying a music service for the cooperative finance industry. We present to you, "Filene." At the start of each year, Filene takes a moment to pause and reflect on insights from our research and incubation and the changes we see on the horizon. Kenia Calderon shares her experience getting a loan for her DACA application. Credit unions are in a unique position to support survivors of DV. Your "how-to" to seeing sooner and acting faster to changing environments. We’ve boiled down our latest research about attraction and retention strategies for credit unions from our Center for the War for Talent. So, a professor, a lawyer and a CEO walk into… a podcast? Listen to this amazing tale of a credit union growth strategy with seemingly no downside. Ep. 39: What’s the Real Issue with Small Dollar Loans? Interview: Ben Morales, Chief Tech + Operations Officer at Washington State Employees CU and CEO of QCash - about small-dollar lending's real issue. Ep. 38: Will Be Done Part 2 -- Why WILL it matter? In this episode we hear from two people who have been involved at various stages of the creation of Will Be Done, the tool that helps people create wills. Ep. 37: Will Be Done Part 1 -- What WILL it be? This episode explores the build-out of an innovative program for credit unions to help their members by making the will-creation process easier. Based on transparency, trust and fair treatment, OBM engages with employees and creates a culture of employee ownership in credit unions. LIVE from Filene’s annual “State of the (Credit) Union” address, where we showcase what’s new at Filene and what we see emerging in the marketplace. Lisa Servon, professor and author of "The Unbanking of America: How the New Middle Class Survives" speaks with us on this episode. We hear from credit unions doing everything they can to support their communities' small businesses, then we talk with a new small business owner. Ep. 31: We Can #BuyTwitter? User-Owned Social Media? What if instead of some other corporation buying up a 'failing' Twitter, we, the users, could buy it and structure it as a cooperative? Families can be awkward... but our i3 concept attempts to take the awkwardness out of lending money between friends and family. Annamaria Lusardi showed me around her humble but impressive research center on Financial Literacy at the George Washington University campus. Managing Director of Research at Filene, Andrew Downin, speaks about the new 5 Centers of Excellence and our 5 Colloquia happening this year. Impact Director Jimese Harkley & Mike Neill of Vertex talk about the challenging task of training leaders and how good coaching can improve organizations. More from CUNA's Governmental Affairs Conference. Visa's Doug Leighton talks about Filene's 5th Center of Excellence: the War for Talent. Introducing the new research Center of Excellence on the 'War for Talent,' I speak with Filene Fellow Dr. Sekou Bermiss and Filene's George Hofheimer. Brandon Michaels, CEO of Mazuma Credit Union and Matt Vance of Salal Credit Union talk about the original Crash event and how it has evolved. The Trust's founder Brent Dixon and the Trust's current manager James Marshall discuss how this whole thing got started and where it's going next. Filener Jimese Harkley and Onboardability CEO/Co-Founder Sean Yokley talk about first impressions in a business context & Onboardability's role. We turn the Filene Fill-In into a "Fosscast" while we get to know our newest member of the team: Managing Director of Innovation, Ryan Foss! Filene360 - our annual celebration with members, friends and partners where we discuss what we see coming to the industry in the year ahead. Constance Anderson, Founder of MemberXP and Erin Coleman, Senior Impact Director walk us a mile (or more!) in our members' shoes. Ep. 17: What's So Savvy About SavvyMoney Anyway? Born from credit score subscription services, SavvyMoney brings the benefits sought by consumers & creates a winning program for CUs. QCash Financial CEO Ben Morales speaks about this short-term small-dollar lending solution that provides instant funding in less than 60 seconds. We talk with Gregg Hammerman, CEO of Larky -- a member engagement and loyalty program that helps credit unions add value for their members. Ed Filene's was born on September 3, 1860 in Salem, Massachusetts. Join us in celebration of the father of the U.S. credit union movement! Filene'rs Marnie and Andrew introduce us to the Debt Dragons and the real issues they are attempting to slay for us out there in the world. Today's Fill-In is all about what Filene has been doing behind the scenes to improve our communications, social media and digital presence. Impact Director Brenton Peck has been a Filene Team member only 4 short months but his skill in delivering Filene's research is anything but short. The NCUF launched their new podcast series Murmurings - I speak with the their Director of Communications about podcasting tips & tricks. Impact Director & Analyst Elry Armaza fills us in on custom research projects, implementing innovation at CUs & developing durable strategies. Sitting down with "acting CEO" George and Patsy, I learned a lot about how Filene performed over the past fiscal year and our plans for forging ahead. Incubator Director Adam Lee teaches us about the research that's forging a path forward through the power of CUs to financially empower all people. Join the conversation with James Marshall as we talk origins of the Crasher movement, future opportunities to get involved and exciting things to come. Rather than a 1-2 day activity producing a 100-page report that few will read, an organization's strategy should be an active part of who they are all year round. Research Manager Stephanie Galligan joins us on the podcast to explain the first research report ever released as part of our new Centers of Excellence. A chat with the fine Filene felines (aka cool cats) Marnie, Andrew and George about CU innovators, bubbling ideas, and the 2025 vision of our industry. 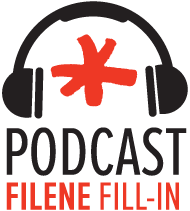 The Filene Fill-In: the podcast where we fill you in on what's been going on at Filene and out and about in the financial services world. Testing, testing! This is our just-for-fun test episode featuring Chief Knowledge Officer George Hofheimer and CEO Mark Meyer. Stay tuned!